Rebels Say Airstrike Hit Libyan Military Convoy Near Brega But the alliance said Moammar Gadhafi's forces have changed tactics in the besieged western city of Misurata by moving tanks and other heavy equipment to civilian areas to prevent pilots from targeting them. 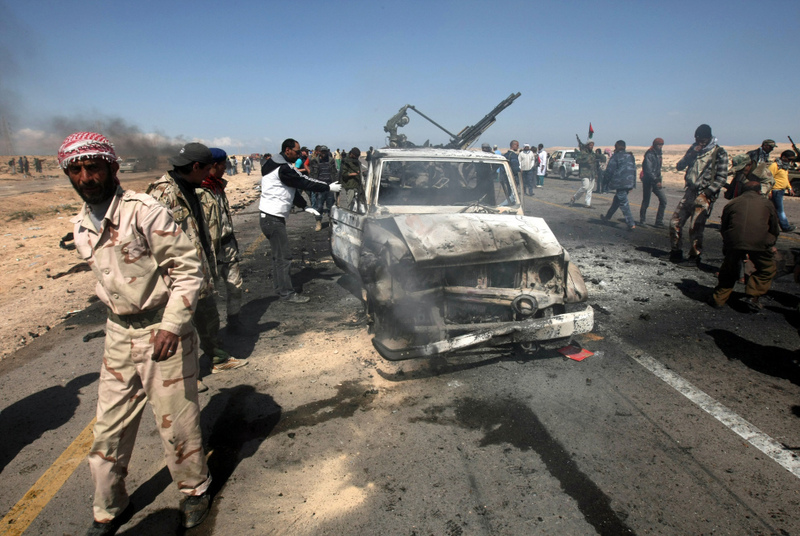 Libyan rebels stand next to two destroyed loyalist pick-up trucks after they were hit by a NATO airstrike on the outskirts of Brega on Tuesday. NATO said Tuesday that international airstrikes against Moammar Gadhafi's forces have destroyed 30 percent of Libya's military capacity, even as regime troops unleashed a withering bombardment against rebels outside an eastern oil town. But the alliance said Gadhafi's forces had changed tactics in the besieged western city of Misurata by moving tanks and other heavy equipment to civilian areas to prevent pilots from targeting them. Dutch Brig. Gen. Mark Van Uhm said NATO carried out 14 attacks on ground targets across Libya on Monday, destroying radars, munitions dumps, armored vehicles and a rocket launcher. He said the military campaign has not been weakened by the withdrawal of U.S. strike assets. Three-quarters of Monday's scheduled strike missions, however, had to return without dropping their bombs or launching their missiles because Gadhafi loyalists made it more difficult for pilots to distinguish between civilians and regime troops, Van Uhm said. He said pro-Gadhafi forces are using human shields to prevent more strikes against tanks and other heavy equipment around Misurata, making it impossible for pilots to target them. "They have chosen to hide themselves into urban areas, even using human shields," Van Uhm said, noting that the tactic also prevents government fighters from using their heaviest weapons as effectively against the opposition. A doctor in Misurata corroborated that Gadhafi's forces have been placing heavy weapons near civilians there for the past two weeks. "They snuck their anti-aircraft weapons and tanks into the city. They are between the apartment buildings and the trees," the doctor, who spoke on condition of anonymity for fear of reprisals, told The Associated Press. "They disguise their equipment on the big agricultural trucks that the farmers use outside of town. They bring in mortars with civilian cars." But Abdel-Fattah Younis, the head of Libya's rebel forces, said the area has no civilians, adding NATO isn't doing enough to protect Gadhafi's opponents. Younis said if NATO wanted to lift Gadhafi's weeks-long siege in Misrata, it could have done it weeks ago. "When a larger force of Gadhafi troops appears with missile artillery," he said, "we tell NATO at once. But their reaction time takes about 8 hours to go through the whole chain of command and by the time they attack, Gadhafi's troops are already inside the city." NATO warplanes have flown 851 sorties in the six days since the alliance took command of all operations from a U.S.-led international force that had been bombing Libya since March 19. On the coastal road leading from the east to Tripoli, the rebels had managed to take part of the oil town of Brega on Monday, aided by an international air campaign. But the rocket and artillery salvos unleashed on the rebels Tuesday indicated the government's offensive capabilities remain very much intact. "When you see this, the situation is very bad. We cannot match their weapons," said Kamal Mughrabi, 64, a retired soldier who joined the rebel army. "If the planes don't come back and hit them, we'll have to keep pulling back." Rebel attempts to fire rockets and mortars against the government forces were met with aggressive counter-bombardments that sent many of the rebel forces scrambling back all the way to the town of Ajdabiya, dozens of miles away. There did not appear to be any immediate response from the international aircraft patrolling the skies that have aided the rebels in the past. Earlier in the day, however, there was an airstrike against a convoy of eight government vehicles advancing toward rebel positions, rebel officer Abdel-Basset Abibi said, citing surveillance teams. Gadhafi's British-educated son dismissed reports Tuesday that his father's inner circle of advisers was crumbling following the defection of Foreign Minister Moussa Koussa. Seif al-Islam Gadhafi said defections among senior members of the regime were to be expected because some of them are old and tired and "not young like us." He also dismissed the idea that Koussa might have new information to offer British authorities about the Lockerbie bombing in which he was a key negotiator. "The British and the Americans ... they know everything about Lockerbie so there are no secrets" Koussa can reveal, Seif said. Late Monday, government spokesman Moussa Ibrahim reiterated Gadhafi's refusal to step down, as the opposition is demanding. He said any changes in Libya must be led by Gadhafi, who has ruled the country for more than four decades. "We could have any political system, any changes: constitution, election, anything, but the leader has to lead this forward," he said in Tripoli. The comments were unlikely to appease the rebels fighting to oust the Libyan leader, who has a legacy of brutality. Any long-term settlement poses tough questions about the fate of Gadhafi's family and the new leader of a post-Gadhafi nation, and the opposition has rejected any solution that would involve one of his sons taking power. President Obama's envoy to the opposition, Chris Stevens, was meeting with members of Libya's Transitional National Council in Benghazi to get a better idea of who they are, what they want and what their needs and capabilities are, a U.S. official said. His visit could pave the way for American recognition of the council as Libya's legitimate government although no decision is imminent, the official said. Stevens was the No. 2 at the U.S. Embassy in Tripoli until the mission was closed in February amid escalating violence. He will be discussing humanitarian and possible financial assistance to the opposition, the official said. The official spoke on condition of anonymity pending an announcement of the visit by the White House on Tuesday. Three countries, including NATO allies France and Italy, along with Qatar, have recognized the transitional council as the legitimate representatives of the Libyan people, but the United States has yet to follow suit. The U.S. has also not made a decision about whether to arm the rebels. Libyan rebels are exporting oil again for the first time in almost three weeks through a tanker that arrived Tuesday at an eastern port, potentially giving them crucial funding for their fight against Gadhafi's forces. The Equator tanker, which can carry 1 million barrels of oil, was chartered by Geneva-based oil trader Vitol SA and was to head for China once loaded, according to Rajab Sahnoun, a senior official at the rebel-controlled Arabian Gulf Oil Co. in Tobruk. The one-off shipment would be only a tiny fraction of Libya's pre-crisis exports of around 1.6 million barrels a day, but is viewed by analysts as a symbolic step forward. "The significance is not only that this is the first shipment in 18 days, but also a signal that Libya is open to international trade and shipping," Michelle Wiese Bockmann, markets editor at London-based shipping data provider Lloyd's List, told the AP. The conflict in Libya caused crude exports from the country, 17th among the world oil producers and owner of Africa's largest proven reserves, to dwindle to a trickle, sparking a surge in global oil prices. Benchmark crude was trading at around $108 a barrel on Tuesday. A delivery from the port of Marsa el-Hariga would bring in significant funds for rebels as Libyan government forces seek to take back the oil port of Brega. With reporting from Teri Schultz in Brussels. Material from The Associated Press was used in this story.